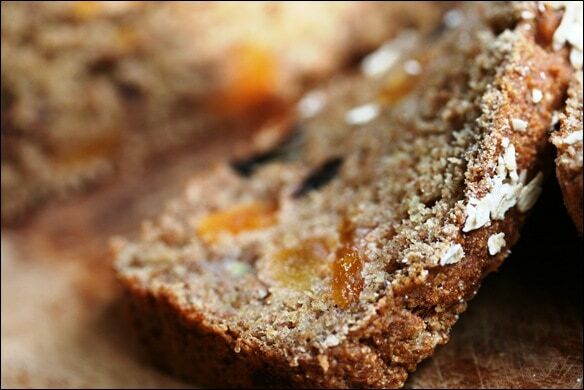 This bread is whole grain, healthy, not too sweet, and delicious. I love the juicy bits of fruit throughout the bread! Great for a morning or afternoon snack. It’s vegan, too! In two separate bowls, mix dry, then wet, and then combine, adding wet to dry and stirring gently until the mixture is uniform-ish. Spoon the mixture into a non-stick or sprayed bread pan; sprinkle some raw oats on top to make it look pretty. Bake 45 to 50 minutes — fork check near end to make sure it’s done! 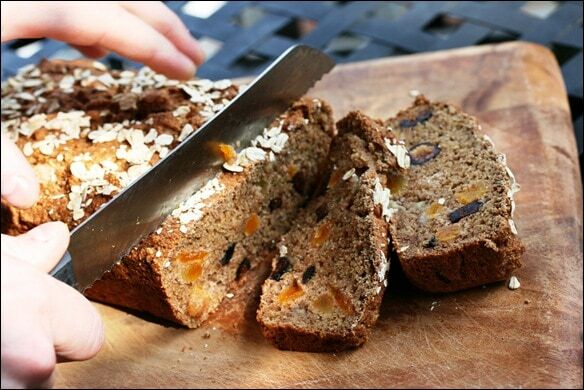 Check out the original post for lots more photos/commentary: Figgy Apricot Spelt Bread Vegan Recipe. Very impressed with your recipes. I love the fact that you don’t use much sugar (I use as little as possible) and use spelt flour. I bake mostly with organic sprouted spelt flour, but use others as well. I never use all-purpose flour. I recommend you use unsulphured apricots in your recipes. Also, organic coconut oil and organic pasture butter are friendly fats. Do not be afraid to include them in your diet. My husband is a retired nutritionist.